• Meigooni A. S., Gearheart D. M., Sowards K., "Experimental determination of dosimetric characteristics of Best® 125I brachytherapy source , Med. Phys. 27: 2168-2173, 2000. 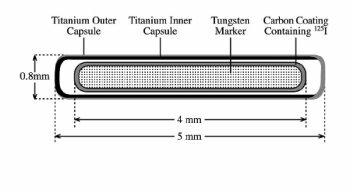 • Nath R. and Melillo A., "Dosimetric characteristics of a double wall 125I source for interstitial brachytherapy," Med Phys. 20: 1475-1483, 1993. • Sowards K. T., Meigooni A. S., "A Monte Carlo evaluation of the dosimetric characteristics of the Best® Model 2301 125I brachytherapy source," Applied Radiation and Isotopes. 57: 327-333 2002.